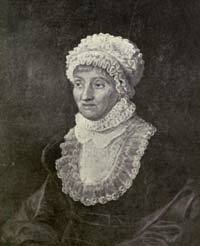 Caroline Herschel was an astronomer in the late 18th and early 19th centuries who lived in both England and Germany. Her older brother was the renowned astronomer Sir William Herschel, and the two siblings worked in close partnership for a number of years. Caroline was particularly known for discovering a number of comets, one of which was named after her. Her personal life was sometimes difficult due to the after effects of typhus, which she contracted at age 10 and which severely stunted her growth. Herschel was born in Germany, and spent her entire childhood there. In her early 20s, she accompanied her brother to Bath, England, where William had obtained a job teaching music. Caroline proved herself to be an impressive singer, to the extent that she acquired a considerable reputation and was asked to perform publicly. However, she was uncomfortable with Bath society and was somewhat isolated socially. When William began studying astronomy as a hobby he fit around his musical commitments, Caroline quickly joined him. At first, the pair worked on the development of more powerful telescopes. Despite her typhus-ravaged body, she possessed immense dexterity, which allowed her to set up telescopes effectively. Caroline also worked as a record-keeper and organizer, categorizing her brother’s copious notes. This work increased her own levels of interest in astronomy and by 1782, she was performing her own observations. After William had advised her to spend time learning to understand astronomy rather than simply observing it, Caroline Herschel discovered a number of comets. She also made history in that she was the first woman to be paid for her scientific work, something that was rare in the 1780s, even for men. However, her brother’s marriage in 1788 reputedly upset her and led to their partnership becoming strained, eventually breaking down altogether. Science benefited from her domestic problems, since she threw herself into increasingly independent research and observation. Most of Caroline Herschel’s observations in the 1780s were carried out with a 27-inch Newtonian telescope. With this she discovered M110, the Andromeda Galaxy’s second known companion. This was probably her most significant discovery during this period. In addition, she discovered eight comets, five of which were certainly unknown to any previous astronomer. In 1798, at the recommendation of her brother, Caroline drew up a new star catalog, which the Royal Society published in 1798 as a considerable improvement to John Flamsteed’s previous catalog. After William died in 1822, Caroline moved back to Germany, although she continued her astronomical work in Hanover for several years. In 1828, she became the first woman to be awarded the Gold Medal of the Royal Astronomical Society and would remain the only female recipient of this honor for more than 170 years. Herschel was given an honorary membership of the society in 1835. She lived into her late 90s, with the King of Prussia bestowing his own Gold Medal on her in 1846 for her work in the cataloging and categorization of nebulae. Herschel died in Hanover on January 9, 1848. A small asteroid and a crater on the moon are both named in her honor.